The shield of the arms is Argent an oil can Gules garnished Argent, accompanied by three grape bunches Purpure leaved Vert. Mural crown Argent with three visible towers (village rank) and white scroll (Bénard Guedes style) reading in black upper case letters "REBORDELO". Flag and arms created and/or pre-approved by Comissão de Heráldica da Associação dos Arqueólogos Portugueses (CHAAP) assessment on 30 October 2000. Rebordelo Commune is one of the 26 communes of Vinhais Municipality; it had 618 inhabitants in 2011 and covers 22.2 km². 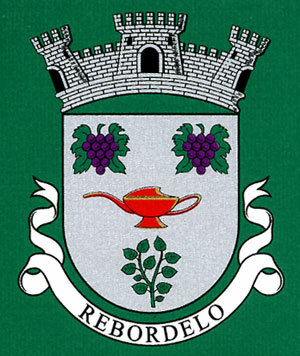 There are two communes in Portugal named Rebordelo - this one in Vinhais municipality and another in Amarante municipality. Why the name of the municipality was not added on the scroll befuddles me. Variants reading "REBORDELO - VINHAIS" are likely.